There are not many reviews on portable aircon online so I think it's worthwhile to post one of my own after having bought and used one. As you may be aware, the weather in Singapore is generally hot and humid on most days. Our attic heats up in afternoon and can be unbearably hot. The reason being that the attic is a space that is directly beneath the roof and the air heats up in the day and becomes trapped in an enclosed space. A ceiling fan will definitely help to circulate the air but we have not considered installing one in the attic. If you were to buy an apartment, try not to select the topmost unit as it will likely have a similar problem to this. Long story cut short, I feel my attic will serve little purpose if it is too hot to enjoy in the day. The idea of installing a mounted aircon unit did come to my mind before moving in and I had also consulted a few contractors who told me that it would be fairly useless because I have an staircase which opens to the storey below and there was no way to enclose it with a door. 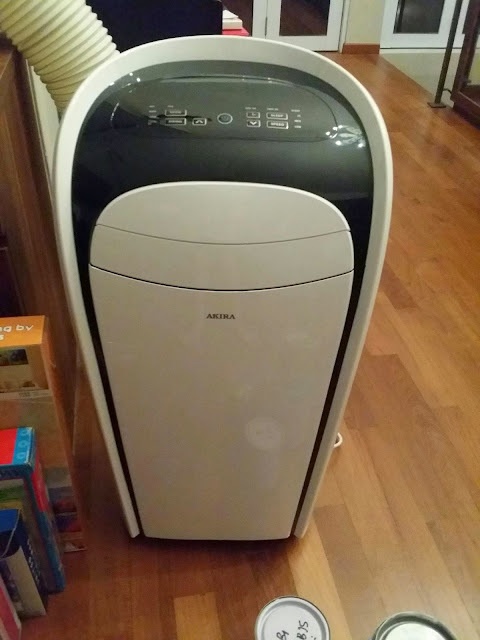 We chose to buy a portable air con from Akira after seeing it on sale in Giant for $399. The unit is stylishly designed and has the capacity of a 9000 BTU. It was intended to be used as a spot cooler. However do note that many malls display their portable aircon without attaching the huge PVC trunking behind. This is an important attachment to pump the hot air out of the room. After using it for a while, I think the most important consideration for such portable aircon units is the noise they generate. It is okay to put it next to you if you are reading a magazine, but it makes too much noise for you to sleep soundly to it. The energy consumption is probably a bit more intensive than the wall mounted unit which uses invertor technology. Another consideration is that it takes up pretty much space, given that it is a floor unit and there is a huge trunking behind it. It is also heavy at its weight of 30 kg. There are wheels for you to roll the unit around. But if you stay on a level which requires you to bring it up the stairs, you need two strong men to hoist it up. Portable air con is not a suitable set up for all types of windows. You need to have one that comes with sliding panels so that the PVC panel (provided with the unit) can sit in comfortably at the window frame. For other window types, you may google DIY videos which provides you with the instructions on how to make a frame for you to insert the trunking out of the window. The merits of this portable unit is that it has a "self evaporative" function. This means that any water residue collected in the machine can be made to evaporate into the air once you switch it off. However, if you intend to switch it on more than 10 hours a day, then the collected water may not evaporate in time and result in water leakage onto the floor. It works slightly better than an air cooler and is able to provide chilled air to the immediate surrounding. The plastic flaps move up and down to circulate the chilled air to a short distance. For a small bedroom, this should work pretty well. But the noise is a killer, unless, of course if you are a very sound sleeper. So is it worth paying a few hundreds to buy a portable air con unit or a few thousand to install a wall unit? It depends on your individual needs. If you need just one unit to cool a particular small area in your home or if you are renting a bedroom from your landlord who refuses to provide you with aircon installation, then this is the choice for you. 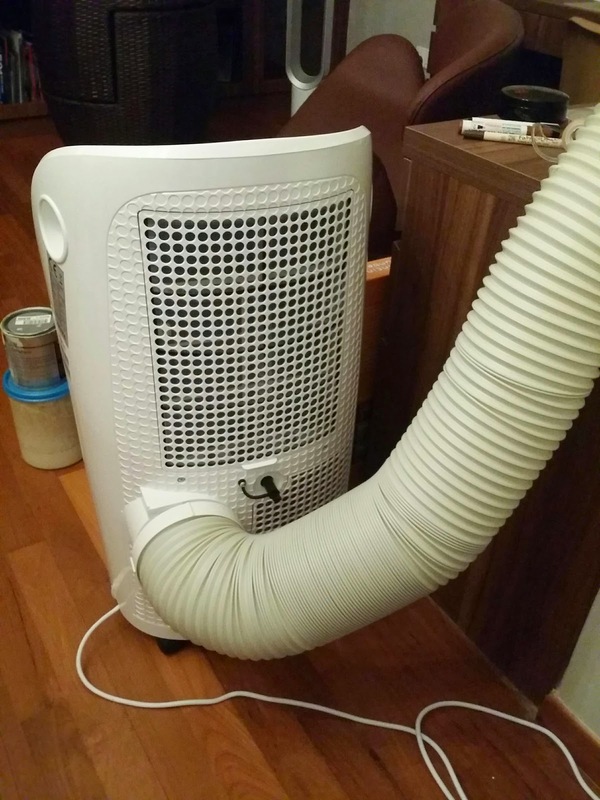 However, if you are a house owner who needs to aircon a few rooms in your apartment and you are staying in one place for the long haul, this may not be the best solution for you. Wall mounted units can be regularly serviced over the long run to prolong its lifespan. I called up Akira service centre and they told me they do not do on-site servicing and you have to bring the unit to them if it is spoilt. All in all, I think it's not really that great an investment. So if you are thinking of getting one, you can consider this after you have no other alternatives such as installing wall mounted air con units, which looks nicer, save your electricity bills and have a longer lifespan.